We came up with 3 Easter egg ideas based on things we saw in the movies. These are simple designs that children can help create because frankly, my crafty skill levels are just not more advanced than that, and I also wanted it to be fun for everyone! Ok, so here’s what I used to make these cute Moana Easter eggs! Let’s start with the egg inspired by Moana’s outfit! To make this color, use 15 drops of red dye and 1 drop of yellow. Add your already hard boiled and cooled egg to a container with 1 cup very hot water and 1 tsp white vinegar, as well as the dye. Let it sit for 10 minutes. If the color comes out a bit patchy, don’t worry about it! I think it looks extra cool that way, to be honest! You can dye more than 1 egg in the mixture but you may want to re-heat the water a bit as that seems to help the color take better (be sure your containers are microwave safe if you do this!). We took a close look at the pattern that can be most clearly seen on Moana’s sash (take a look here) and then practiced it a few times on a piece of paper. Then we simply drew it with a red marker onto the egg. Easy peasy! 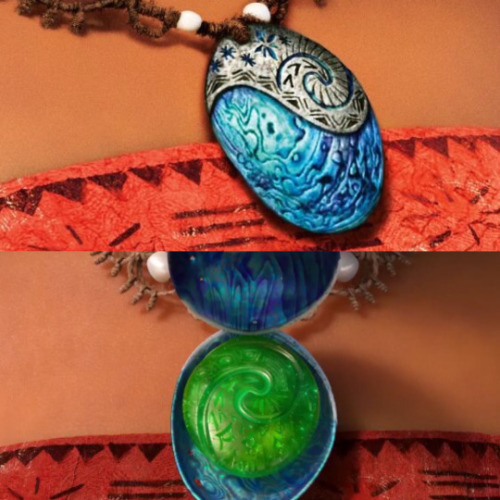 This is modeled after the necklace that Moana’s grandmother gives her. It hold the heart of Te Fiti (more on that in a minute!). To make this color, use 15 drops of blue, and 1 of yellow in your cup of very hot water with 1 tsp. white vinegar. Let it sit for 10 minutes. Once the egg is dry, you will use some tempera paint in silver or gray and paint the top third or so in the same shape as what you see on the original (take a look at the top image here). This will take a little while to dry, so be patient or break out the hair dryer to speed things along. Once it is completely dry, create the design on the silver part of the necklace with a gray marker. Then using glitter glue, or a toothpick dipped in glitter with glue, or a tiny paintbrush with silver glitter and glue, go back over the design to help it stand out a little bit more. 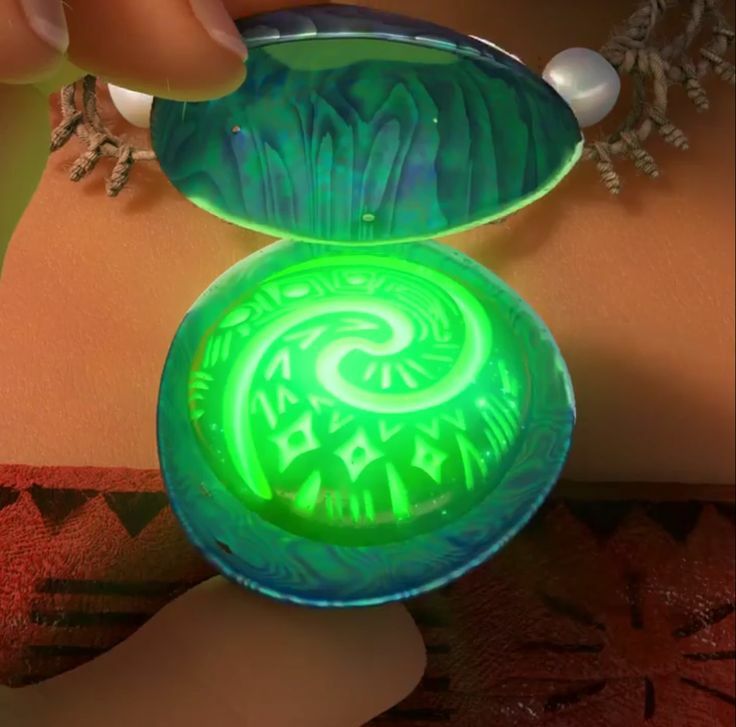 And now for the heart of it all…the heart of Te Fiti! To make this color use 12 green, 6 yellow and 3 blue along with 1 cup very hot water and 1 tsp. white vinegar. Let the egg sit for 10 minutes. We looked closely at the design on the heart (look here) and since it was more subtle in its overall look, we decided at the last minute to simply use school glue to create the swirls and then the other detailing. Then we used a pre-mixed combo of evergreen and key lime glitter and sprinkled it all around, and then let it dry. We did another one where we drew out the design using a green marker, followed by glue and glitter. It looked pretty, too, but the pictured approached looked closer to the read thing, so that’s the way I’d recommend doing it! These eggs are extra fun when you put them in a basket with leis used in the place of Easter grass. You can score a big pile of leis for pretty cheap online! I hope you enjoy working together as a family on this fun Easter craft idea! Let me know if you come up with any additional Moana-inspired Easter egg ideas! Do you need some ideas for what to fill your Easter baskets with this year? Moana stuff, of course! Here are some really great ideas to go along with the theme!